October 31 – Halloween for most, but here in Ajijic the day is dedicated to the town’s patroness, the Virgin of the Rosary. Most incorporated towns in Latin America have a patron saint, as well as an incarnation of the Virgin Mary. Certain neighborhoods might have their own patron or patroness, as well. 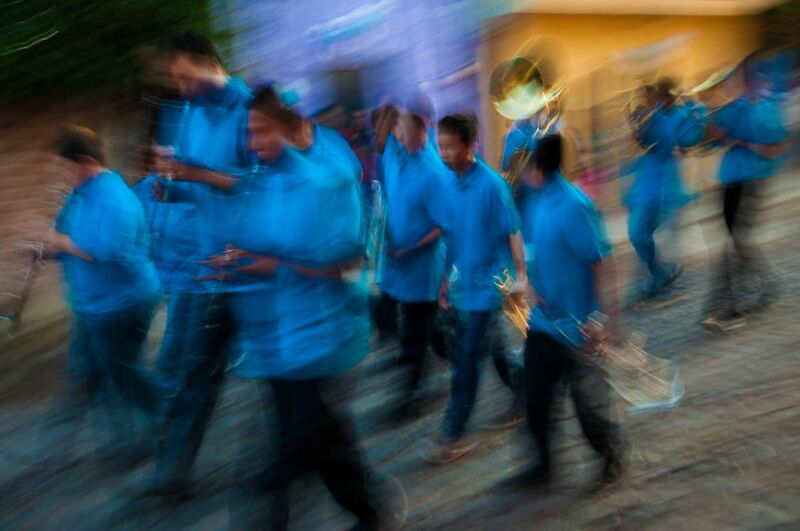 Even Ajijic, a modest town of 10,000, has several barrios under the auspices of different saints and virgins. The celebration for the town’s main patroness, the Virgin of the Rosary, lasts all October and culminates in a procession through town on the evening of the 31st. 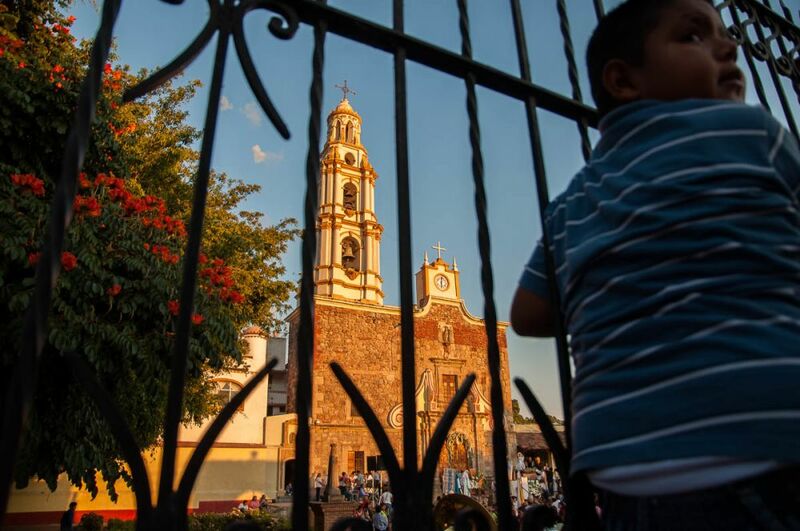 A boy watches the fiesta-day mass which takes place in front of San Andrés Church in Ajijic, Jalisco, Mexico. 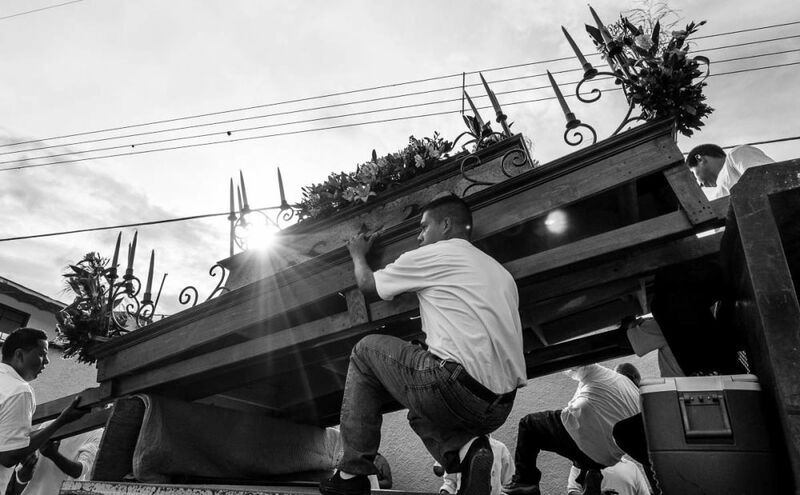 Parishioners lift the heavy wooden carriage which will take the image of the Virgin of the Rosary around the streets of Ajijic. 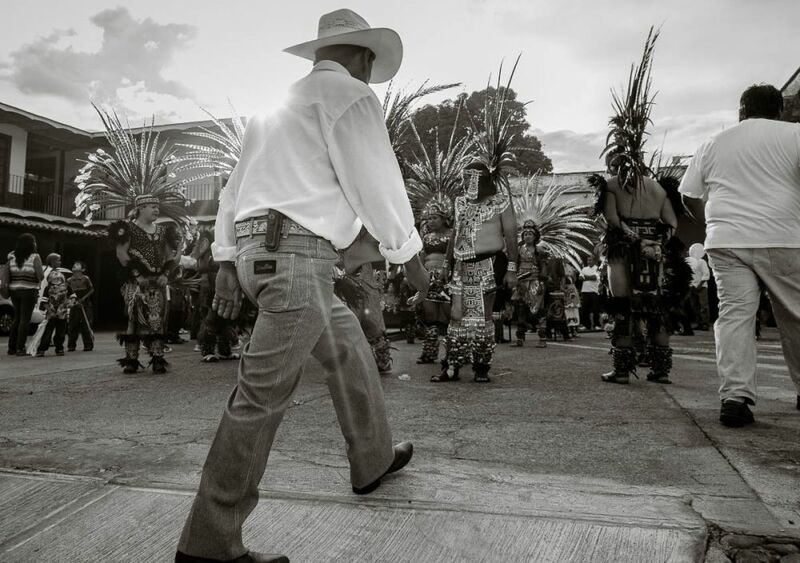 A man walks through a group of Aztec dancers who are preparing to dance at the front of the procession for Our Lady of the Rosary. 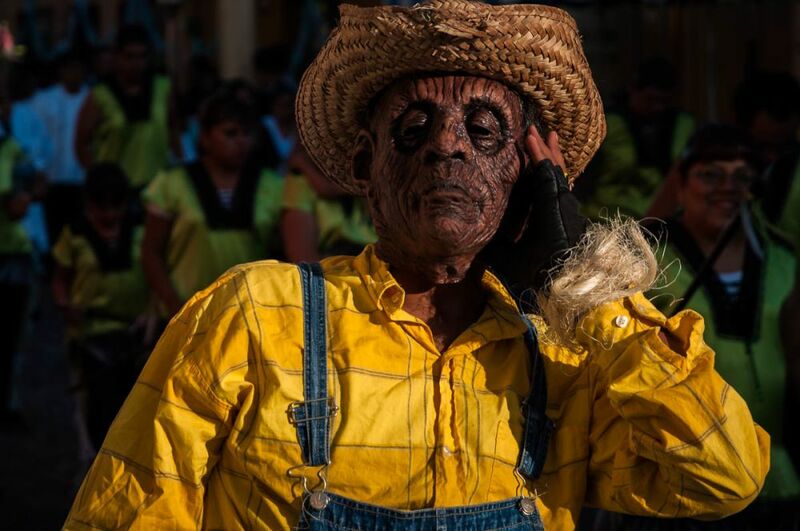 A masked participant of the parade for the Virgin of the Rosary on October 31, 2010. Ajijic, Jalisco, Mexico. 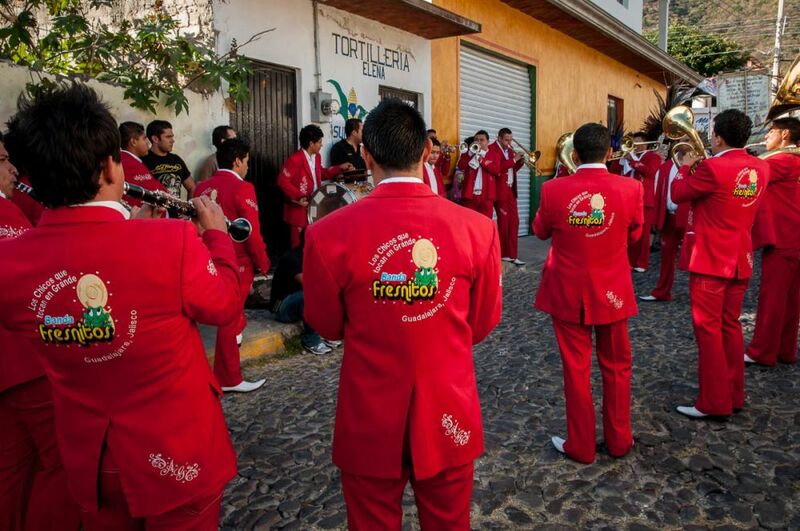 Banda Fresnitos play some songs before the procession in Ajijic for Our Lady of the Rosary. 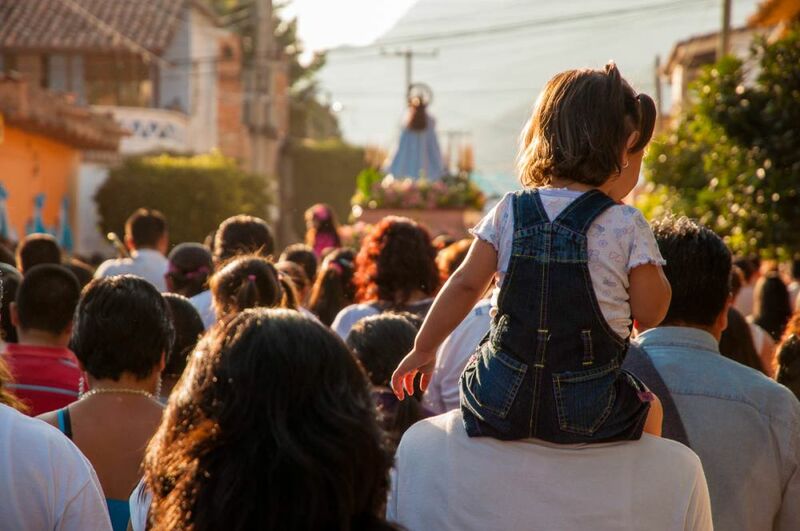 A girl uses some shoulders to get a better view of the procession trailing behind the image of the Virgin of the Rosary. 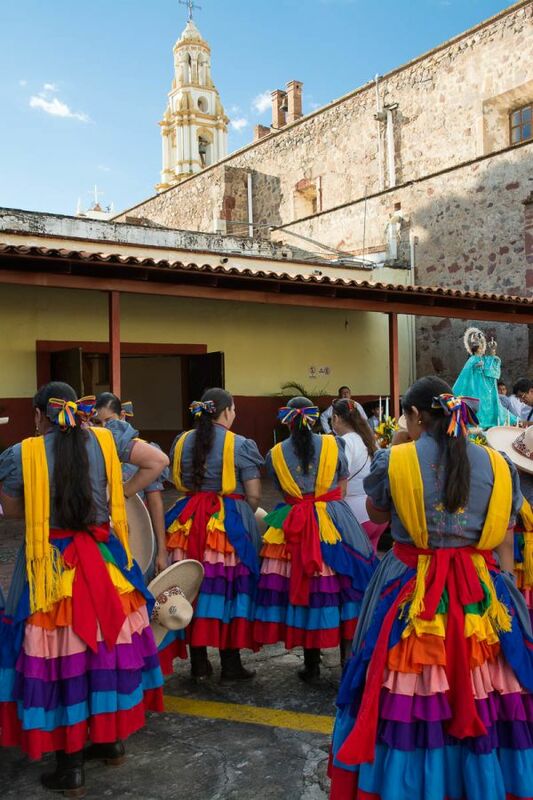 The town’s escaramuza cowgirls, Xiricahuas de Ajijic, accompany the image of the Virgin during the procession, using a long sash or rope to encircle moves through any crowded parts of the procession. 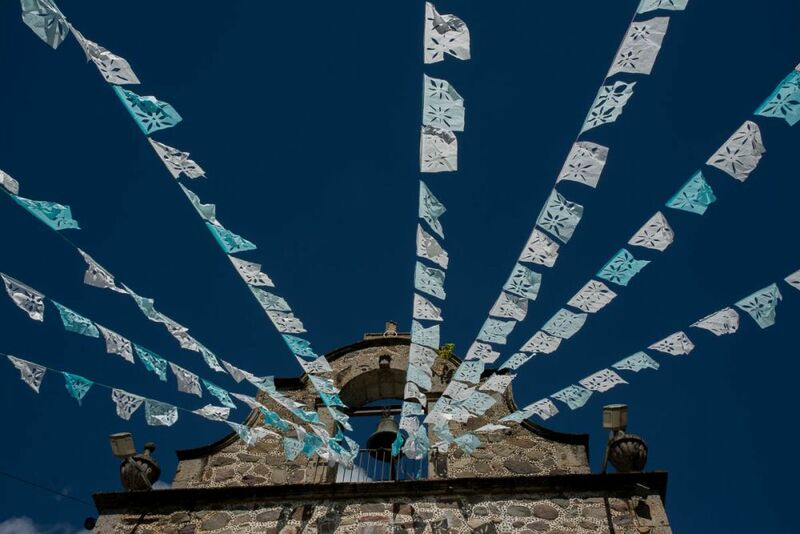 Papel picado flies from the church of Our Lady of the Rosary on the plaza in the Ajijic, Mexico. A castillo fireworks castle burns after dark during the final day of the Fiesta for Our Lady of the Rosary. Learn more about Mexican fireworks castillos. 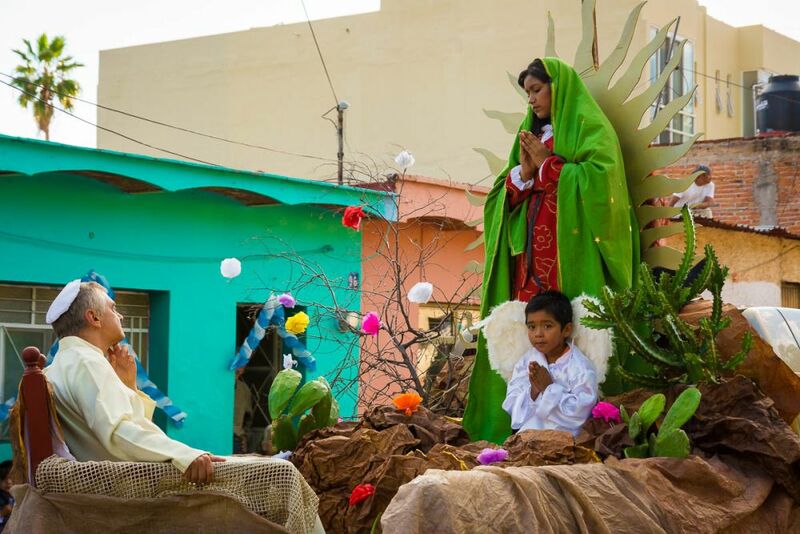 A float in the procession depicting Mexico’s most important Marian apparition, Our Lady of Guadalupe, and Pope John Paul II, who is still the pope you most often see represented in Mexico, on tombstones, in churches, and in carro alegóricos such as this one. 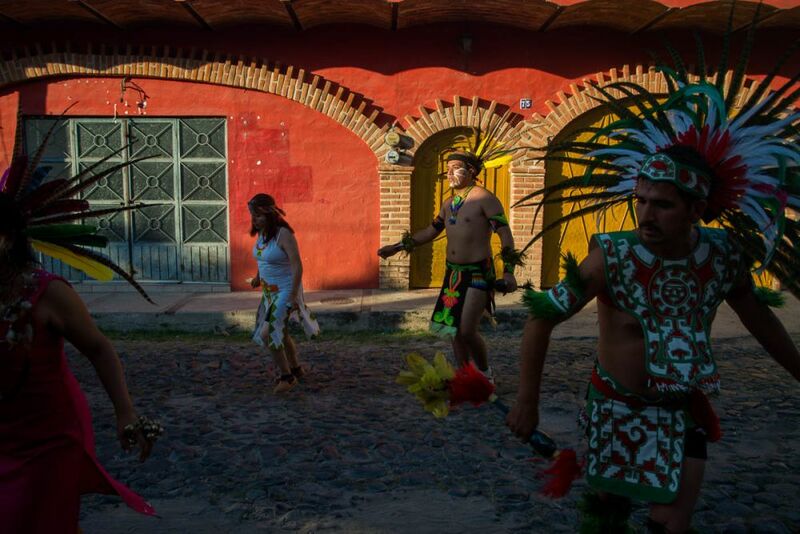 Aztec dancers are a big part of the procession, as they are during many of the town’s holidays. Aztec dancers during the Fiesta for Our Lady of the Rosary in Ajijic. 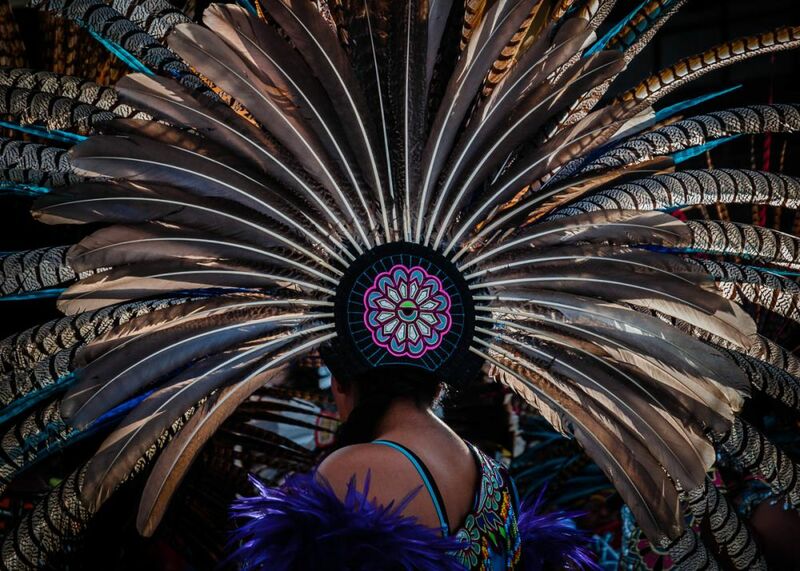 An Aztec dancer during the Fiesta for the Virgin of Rosario in Ajijic, Jalisco, Mexico. The banda playing songs during the procession. 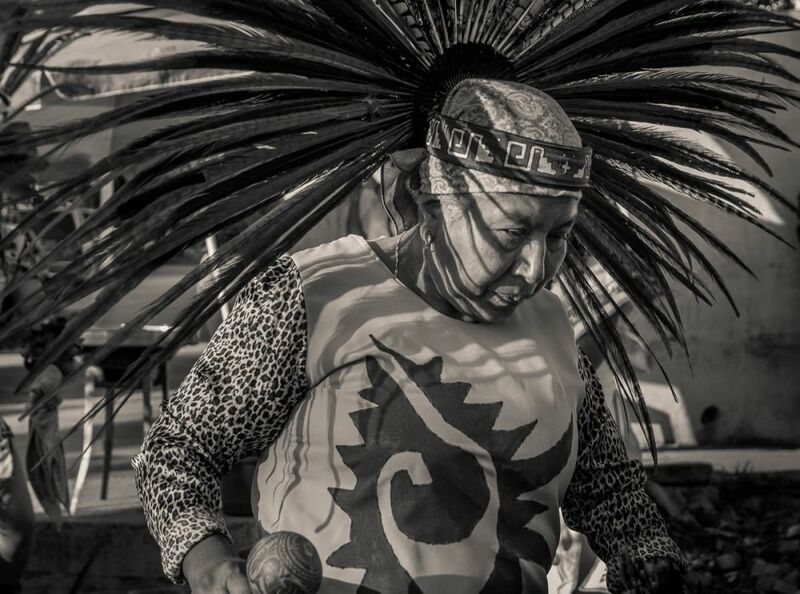 An Aztec dancer during the Fiesta for Our Lady of the Rosary in Ajijic, Jalisco, Mexico. A member of the marching band blows his bugle during the procession. A man carries bundles of rockets which he and the hired pyrotechnics crew will shoot off during the procession. A man lights a rocket during the procession. The rockets shoot a couple hundred feet into the air before exploding with a giant boom. Shadows from hanging papel picado casts shadows on a wall on the grand final day of the Fiesta of Our Lady of the Rosary in Ajijic, Jalisco, Mexico. Doorway decoration for the procession of Our Lady of the Rosary in Ajijic. 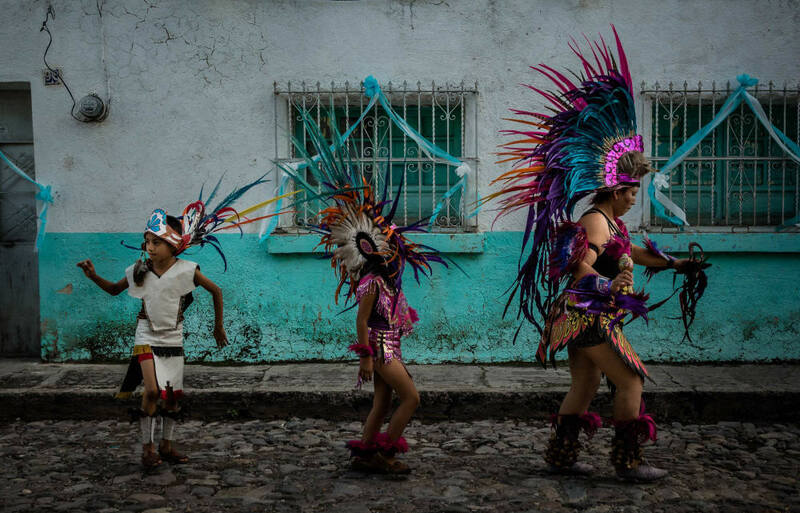 A young Aztec dancer takes part in the procession for the Virgin of the Rosary in Ajijic. Parents help an even younger Aztec dancer take part in the procession. 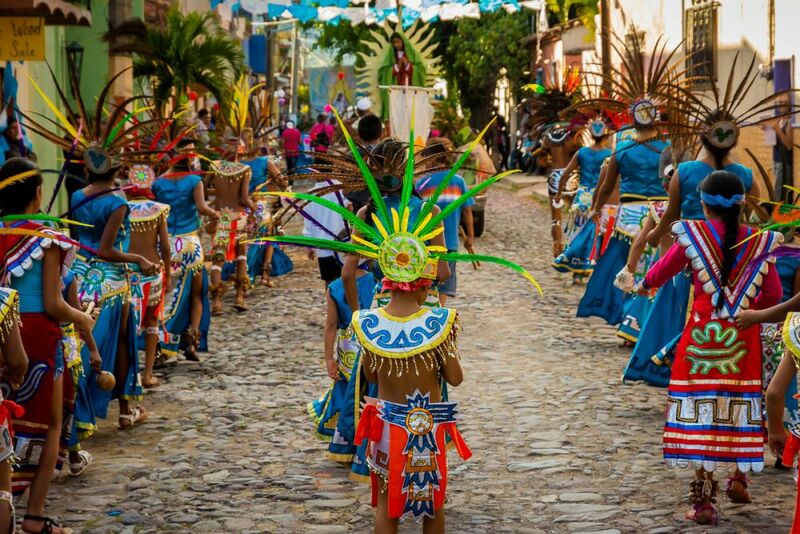 Aztec dancers during the Fiesta for Our Lady of the Rosary in Ajijic, Jalisco, Mexico.